This graphic novel brings to life William Ayers's bestselling memoir To Teach: The Journey of a Teacher, Third Edition. From Ayers's early days teaching kindergarten, readers follow this renowned educational theorist on his "voyage of discovery and surprise." We meet fellow travelers from schools across the country and watch students grow across a year and a lifetime. 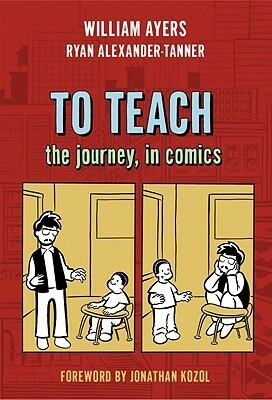 To Te This graphic novel brings to life William Ayers's bestselling memoir To Teach: The Journey of a Teacher, Third Edition. From Ayers's early days teaching kindergarten, readers follow this renowned educational theorist on his "voyage of discovery and surprise." We meet fellow travelers from schools across the country and watch students grow across a year and a lifetime. To Teach is a vivid, honest portrayal of the everyday magic of teaching, and what it means to be a "good" teacher--debunking myths perpetuated on film and other starry-eyed hero/teacher fictions. Illuminated by the evocative and wry drawings of Ryan Alexander-Tanner, this literary comics memoir is both engaging and insightful. These illustrated stories remind us how curiosity, a sense of adventure, and a healthy dose of reflection can guide us all to learn the most from this world. This dynamic book will speak to comic fans, memoir readers, and educators of all stripes.